I have plenty of imperfections that might scare guys away, from barely having time for a social life to loving shoes more than I like people. Match.com has decided to make us proud of these imperfections with their Love Your Imperfections campaign and I'm a massive fan of the whole idea. These imperfections are what make us who we are and our little quirks that other people should love about us. To go with this, they very kindly made me a custom made mug, which loudly mentions my main imperfection, in my eyes: my loudness. I have definitely been known to be WAY louder than I need to be and often have to be told to tone it down. 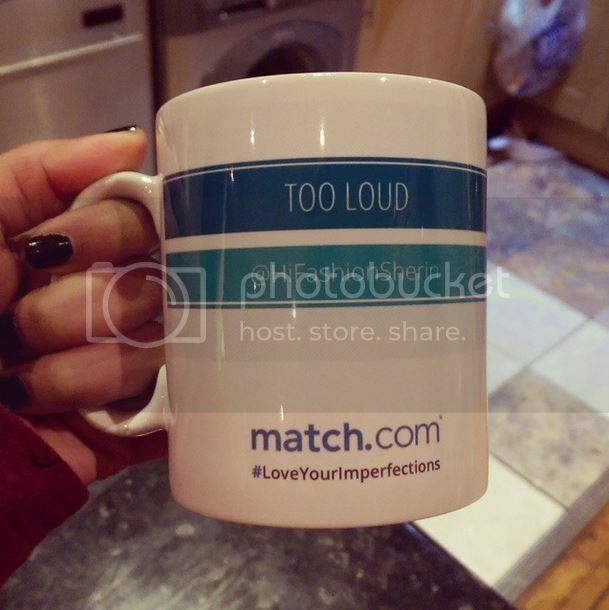 Match.com are also giving you the opportunity to get your own custom made mugs too. All you have to do is tweet with the hashtag #LoveYourImperfections and mention the imperfection you want to resolve this year. You can find out more information here. You can see the ad for the campaign here as well as a great infographic here. What a great campaign - love that mug! Haha how cute! Oh Sherin that mug is brilliant!